Her AKC name is Moxie Mae. What does this have to do with running 100 miles? Absolutely NOTHING. But, my Boy asked me to write about the fur-covered love of his life. How could I say “No”? It matters not to him that Mox has zero interest in running with me. I’ve tried. She starts out strong, and after that block, she lags behind and looks for someone to play with. She is great on trails, not because of running, but because of her eternal quest to find water. I’ve lost her if she finds a body of water. She will make eye contact, wait for the nod, and I just wait to hear the splash. She’s gone. I had better plan on running around whatever pond she has found, because I won't be leaving that area any time soon. So, Noah, this blog is for you, and your underwear eating, sock stealing, epic “I’m so happy to see you again” reunion, loud snoring, mega happy, Moxie. 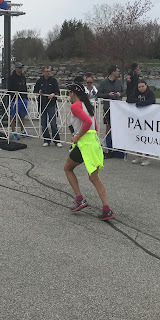 Oh, and because this is a running blog: I ran 100 miles at Canal Corridor in Akron. It was fun. Moxie knocked me over to congratulate me when I got home...Noah was with her.